The Alien Animals File, a Legion-era Bestiary, is in my opinion a handy resource for GMs. Like a D&D Monster Manual, the super-powerful alien animals it profiles are good for random encounters, but they’re also handy if you have shapechanging characters. At any rate, I was researching alien animal stats, and Monster Master’s storyline has several of the most memorable, so I wrote him up. It’s also one of the first stories in which neither Superboy nor Supergirl (nor their stand-ins, Mon-El or Ultra Boy) plays a role, forcing the less powerful Legionnaires to stand on their own. Presumably this is because the Legion of Super-Monsters would be toast against any of the Kryptonian power-set. Still, they’re pretty formidable otherwise, and the Legion of Super-Monsters was the first rival Legion to form in opposition to the Super-Heroes. Known Relatives: Dez-Nu (father, deceased), Dr. Marden King (brother). Group Affiliation: The Legion of Super-Monsters (sort of). Base Of Operations: Monster World. 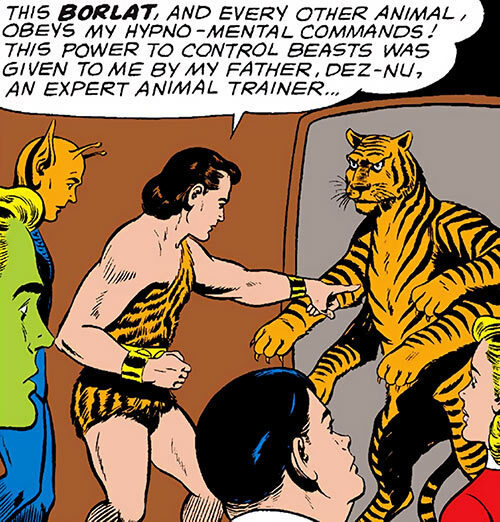 Monster Master’s “hypno-mental commands” allow him to control animals of all types. He can control multiple creatures at once, but he must maintain his concentration at all times. Monster Master showed some scientific knowledge of how to attract and train animals. He also was able to pilot a spaceship and use a gun. Furthermore, I guess that he has money. His father could afford the experiments that gave him his power, and Jungle King owned a spaceship (in today’s terms, the equivalent of owning a large private jet) with significant speed and enough cargo room to transport his monsters. Monster Master, real name unrevealed, was the son of an expert animal trainer named Dez-Nu. Dez-Nu wanted to make his son the greatest of all animal trainers. He performed experiments on the boy. He eventually found a way to alter his brain structure so that he could project “hypno-mental commands” that controlled animals. The youth decided that he could use this power to become a Legionnaire. 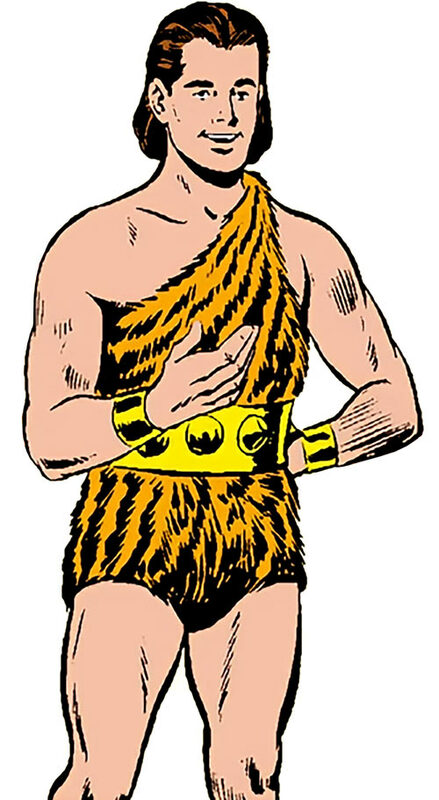 He applied to become a member of the Legion of Super-Heroes under the name Jungle King. Jungle King went to a Legion try-out accompanied by an untamed borlat (a six-legged tiger, basically), demonstrating his “absolute” control over it. But while telling the story of his origin, he forgot to maintain his concentration, and the borlat charged him. He had to be rescued by Sun Boy, and the Legion rejected him for his lack of control. Jungle King left in a rage, swearing that the Legionnaires would find they’d made a big mistake rejecting him. The Legionnaires were left wondering if his father’s experiments had warped Jungle King’s mind and personality. Vowing revenge on the Legion, Jungle King travelled to a bizarre planet called Monster World (one assumes this is not its official designation!). He now began to call himself Monster Master. Monster Master set up lures to bring creatures to him, then took control of them and commanded them to show their abilities. In this way he created a Legion of Super-Monsters, consisting of an Earthquake Beast, Eye Monster, Mirror Monster, Drill Beast, and Omnibeast. He rejected a super-spinner beast because its whirlwind was not powerful enough, and a gas creature because its power to vaporize at will was interesting but “not useful enough”. Monster Master then set out on crime spree, mostly to show the universe that the LSH was powerless to stop him. And if they tried to interfere, he swore to destroy them. Monster Master’s first target was the Space Bank, which he and his Legion of Super-Monsters robbed with ease. He then set his sights on the rarest jewels in the universe, the comet jewels of Sky City on the planet Korr. The LSH caught up with him there and engaged the Super-Monsters. But Monster Master managed to give them the slip, with the jewels. This occurred when the super-heroes were forced to leave the battle and save Sky City from the power of the Earthquake Beast. The group of Legionnaires which battled the monsters (Sun Boy, Saturn Girl, Brainiac 5, Chameleon Boy, and Bouncing Boy) considered this the LSH’s first defeat. They vowed to track down Monster Master and bring him to justice. Saturn Girl’s ESP powers allowed the Legionnaires to track Monster Master to Inshar, the world of giant flowers. Their special seeds were considered a rich treasure. The Legionnaires found the Driller Beast alone (left by Monster Master to guard his ship). Sun Boy, Brainiac 5, and Chameleon Boy captured the Driller Beast, and Chameleon Boy took its place. But before the Legionnaires could use the opportunity to take Monster Master by surprise, Bouncing Boy accidentally gave their presence away. Monster Master decided to flee rather than risk another battle just then. As a result, Chameleon Boy found himself forced to maintain the Driller Beast disguise and go with the monsters. Monster Master managed to get far enough away that Saturn Girl could no longer pick up his thoughts. He found a barren planetoid to hide in until the pursuit cooled. But Chameleon Boy dropped his disguise, snuck into the ship’s communications array and signaled for the Legion. Catching him in the act, Monster Master loosed his beasts on the spy, and Chameleon Boy was forced to cause a cave-in to separate himself from Monster Master’s creatures. The Omnibeast was caught on Chameleon Boy’s side of the cave-in, but Chameleon Boy managed to pacify it. Meanwhile, Monster Master took his three remaining creatures and fled back to Monster World for reinforcements. The other Legionnaires responded to Chameleon Boy’s signal and freed him. They also released the Omnibeast, gambling that it would instinctively return home, which it did. This allowed the Legion to find Monster Master’s base. Monster Master had left the Earthquake Beast on guard, ready to destroy any other ship that tried to land on Monster World. Meanwhile, he sought out new creatures for his Monster Legion. The gas creature he’d rejected before approached, seemingly wanting to join, but he again rejected it and kept looking. Meanwhile, the Legionnaires had arrived in orbit. Since they couldn’t land openly, they chose to send one Legionnaire in alone to try capturing Monster Master secretly. They drew lots and Bouncing Boy was chosen. The others tried to talk him out of it because of his limited power, but Bouncing Boy had a plan for dealing with the Earthquake Beast. He insisted on taking on the mission. Rather than trying to sneak past the Earthquake Beast, Bouncing Boy confronted it directly. His bouncing power gave him the speed and agility to avoid the monster’s attacks. Then, he maneuvered it into striking a cliff with its powerful, earthquake-inducing tail. The Earthquake Beast’s own power buried it in rocks, and the most dangerous of Monster Master’s creatures was defeated. Monster Master felt the vibrations and rushed to the scene. But before he could do anything, the gas creature he had rejected grabbed him from behind. The gas creature turned into a vapor, revealing an unsuspected ability to also vaporize anything it held. In this case, it was holding Monster Master, who never rematerialized. Ironically, the crazed Legion reject was ultimately destroyed by the creature that he, himself, rejected. Jungle King’s older brother, Dr. Marden King, would later try to avenge his brother’s death. He duped exiled super-beings from the planet Lallor into attacking the LSH as the Legion of Super-Outlaws. Ultimately, the Legion cleared up the misunderstanding, and made it possible for the Super-Outlaws to return to their homeworld. There they became the Heroes of Lallor and are staunch allies of the LSH. Jungle King is a teenager of average height with brown hair. He wears an animal skin typical of heroes from the “jungle” genre, with a belt, bracers, and sandals. 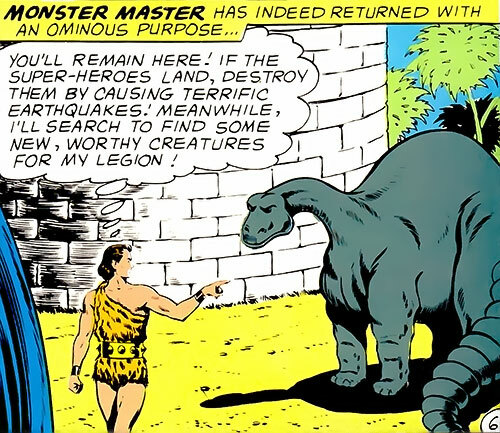 Monster Master originally wanted to join the Legion, and was supremely confident that his power over animals would get him in. But whether it was caused by his father’s experiments or not, he seemed to have a warped personality. He was boastful, arrogant, and completely unable to handle rejection. Rather than try and prove himself to the Legion or improve his mastery of his power, he became enraged. He was obsessed with revenge. The thefts he committed had nothing to do with money. He didn’t even bother to take all the money from the first bank he robbed. It was simply about showing that the Super-Heroes couldn’t stop him. 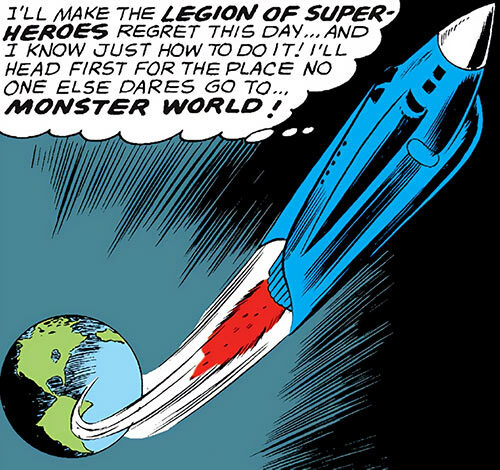 Come on, there’s got to be a team-up between the Legion of Super-Monsters and the Monster Society of Evil! Who’s with me!?!?? Animal Control doesn’t require Speak with Animals (+1 or 0, depending on House Rules), but does require the expenditure of an Automatic Action each phase to maintain control. It only takes one action to maintain control of multiple animals, though. Should his control slip, the critters will get free, and generally attack Monster Master (-1 FC). Area Knowledge (Monster World), Language (Interlac), Headquarters (Base on Monster World), Scholar (exotic alien animals). Dr. Marden King (presumably High). Minor Psychological Instability (causes ranting and raving), Serious Irrational Attraction (humiliating the Legion of Super-Heroes). Various lures (with sound, scent, and visual elements) with the cumulative effect of Animal Summoning: 14. As noted in the history section, Monster Master used his powers to control and exploit five super-powerful creatures which he called the Legion of Super-Monsters. These are not Pets in DCH terms, as he has to concentrate to maintain control of them; but under his influence they can follow sophisticated commands, including being left to guard an area from intruders. The creatures that made up the Legion of Super-Monsters (an Earthquake Beast, Eye Monster, Mirror Monster, Drill Beast, and Omnibeast) receive a special sub-section of their own within the Alien Animals File, a Legion-era bestiary compiling stats for the creatures of the 30th and 31st centuries. 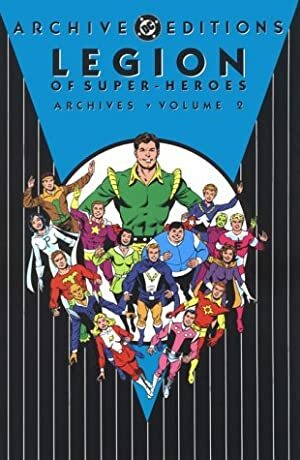 The official writeup by Mayfair is in the Legion of Super-Heroes sourcebook volume 1. This writeup is a newly researched and updated take. As with all characters with only one appearance, there’s some speculation involved in these stats, and some things (like his spaceship) are bare bones indeed. Also, I didn’t figure his equipment or spaceship into his HP cost. These are standard off-the-shelf purchases which are covered by his Wealth. Source of Character: pre-Crisis DCU (Adventure Comics #309). Helper(s): LSH sourcebook vol.1 by Mayfair Games; The Silver Age Legion Site (defunct). Writeup completed on the 2nd of June, 2011.